The Sun Prairie Education Foundation was formed in 2005 with a mission to enhance education for students in the Sun Prairie Area School District's public schools. Consisting of community members, the Sun Prairie Education Foundation Board of Directors solicits donations from the public to provide enhanced educational opportunities throughout the district's public schools. We are an independent 501(c)(3) corporation and not affiliated with the Sun Prairie School Board. The board's independence demonstrates a commitment to keeping local politics out of the classroom and rewarding educators who have outstanding educational program or enhancement ideas that can't be funded by traditional budgetary resources in the Sun Prairie Area School District. Founding board members included former Sun Prairie Chamber of Commerce president and Sunwood Apartments owner Glenn Fenske, Rita Tubbs, former Sun Prairie Area School District Adminstrator Ollie Berge, Randy Handel of McGann Construction, Bank of Sun Prairie Vice President Ron Blawusch, educator Nancy Everson, Ann Hamilton from American Family Insurance, former 46th Assembly District Rep. Tom Hebl, Kip Kobussen of General Casualty Insurance, Beans 'n Cream Coffeehouse co-owner Beth Mielcarek, former Sun Prairie Chamber of Commerce President Kevin Noskowiak of Smith & Gesteland, and retired Eastside Elementary Principal and high school vice principal Tom Yelich. The board is also advised by the Sun Prairie Area School District Superintendent and a Sun Prairie School Board member in a non-voting capacity. The Foundation launched in 2005 with an incredible Special Purpose Fund named for longtime Sun Prairie High School economics teacher George Conom. 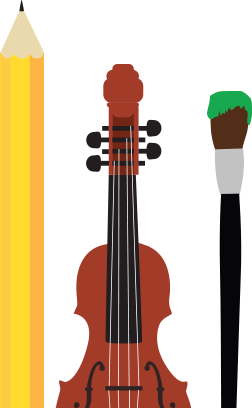 The George Conom Excellence in Education Fund provides resources to support extraordinary educational opportunities while enhancing the Sun Prairie educational experience students receive in the Sun Prairie Area School District. Examples of projects which the initial launch of the fund used included an outstanding annual speaker on a topic of relevance in the district; creative learning experiences outside the classroom, and financial literacy workshops. The Mielcarek Family Foundation Fund was established in 2006 through a gift by Tim, Beth and Matt Mielcarek. The Mielcarek family made this gift to support programs that assist economically disadvantaged children in the Sun Prairie Area School District. The Foundation's fund-raisers have provided an opportunity for the public to support the mission of the Sun Prairie Education Foundation. The Foundation began our fund-raising efforts with a Pig Auction at the home of the Mielcarek Family. Local and national celebrities were charged with decorating ceramic piggy banks which were auctioned with all proceeds benefiting the Foundation. Although many notable celebrities decorated pigs, perhaps the most notable celebrity whose pig was auctioned, then re-donated back to the Foundation and auctioned again, was decorated by Steve Carell, star of the NBC-TV series "The Office" and films such as "The 40-Year-Old Virgin" and "Evan Almighty." 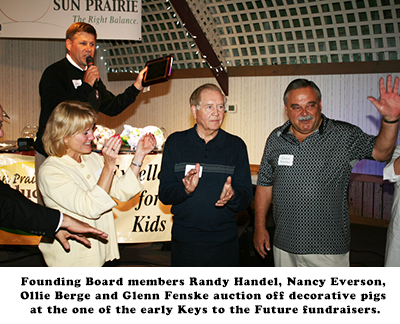 The auctions continued, but evolved into the Keys to the Future Event held in 2008 at Angell Park Pavilion, where bidders could not only bid on celebrity decorated pigs, but also silent auction items. Beginning in 2009, the Keys to the Future event will feature silent auction items with all proceeds benefiting the Foundation. Ten years later the Sun Prairie Education Foundation is stronger than ever. “Imagine. Invest. Inspire” has become our tagline and we continue forward with our mission, thanks to all the generous donors helping make a difference in Sun Prairie. In the 2014/2015 school year alone, we were fortunate enough to provide nearly $50,000 in funding to help our local educator’s and administrator’s dreams come to fruition. We look forward to the next 10 years! DID YOU KNOW? You don't have to be a teacher to apply for a grant. If you are a parent, a student, a business owner or anyone who wants to help Sun Prairie youth, you can write a grant!